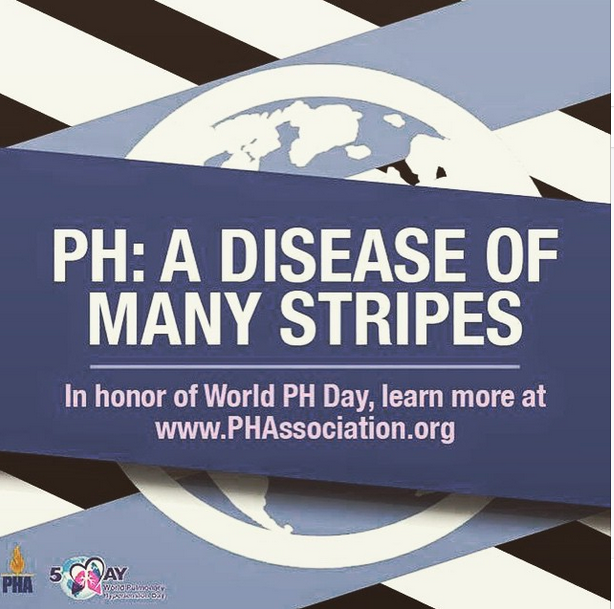 Today is World PH Day and to help spread awareness about Pulmonary Hypertension I decided to do a blog post with some facts about PH and an explanation of what this disease is. So what is Pulmonary Hypertension? According to PHA (Pulmonary Hypertension Association) it is defined as: a rare and debilitating disease in which high blood pressure in the arteries of the lungs can lead to right heart failure. Please note that this is not the same thing as high blood pressure, therefore it cannot be treated as such. People commonly mistake or assume that it is similar and can be treated as easily as high blood pressure. There are two types of PH. Primary and Secondary. Primary is the type of PH that a patient has for no reason. They don't know why you have it, you just do. Secondary means it is caused by something, typically another illness. I have secondary PH to my Pulmonary Atresia, which is a heart defect that causes the pulmonary arteries to be extremely small, mine could be considered "hypo-plastic" because they are so small - which means they don't even exist. There is no cure for PH. High elevation is not good for PH patients due to the thinning of the air. When I fly or go above 3,000 feet, I have to wear oxygen. PH can only be diagnosed through measuring the pressures in the pulmonary arteries via a heart cath. For this procedure, a long, thin, flexible tube called a catheter is put into a blood vessel in your arm, groin (upper thigh), or neck and threaded to your heart. Through the catheter, your doctor can do diagnostic tests and treatments on your heart. If you would like anymore information, feel free to ask questions in the comments below or check out the PHA website that I linked above. Please help raise awareness of this terrible disease by saving the 'WorldPH Day' photo I posted above and posting it on your social media accounts. With your help, we can help raise awareness and hopefully someday find a cure for this terminal illness.